Precision engineered tapered shims supporting over 2000 Lbs five columns of offset ridges on both sides insure they are securely stackable and will not slip, or twist apart under load level, stabilize, tighten or silence anything that wobbles, tilts or rattles use for stabilizing and leveling tables, bookshelves, appliances, fountains, counter tops, cabinets and more stack them flat or at an angle to fill any gap size lwh: 1 inch x 1-1/4 inch x 1/4 inch securely stackable powerful no-slip grip grabbar for easy retrieval won’t shrink or swell precision ADJUSTMENT grid. 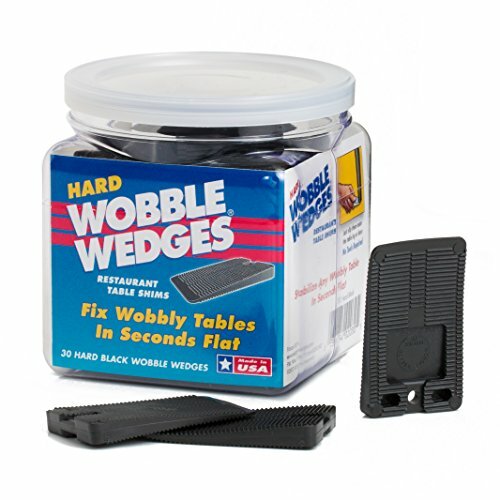 If you have any questions about this product by WOBBLE WEDGES, contact us by completing and submitting the form below. If you are looking for a specif part number, please include it with your message.